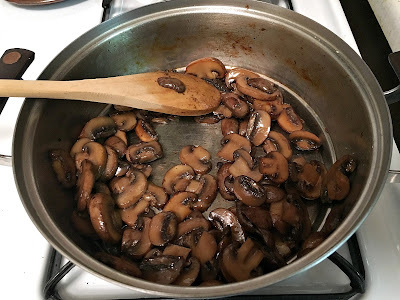 Since reading about the benefits of cooked mushrooms a couple of years ago I try to eat them daily. 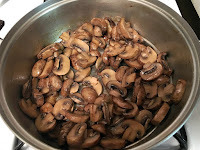 I would usually roast them along with broccoli and red onions or saute them in a skillet with a little olive oil and I was relatively happy with those methods. When I sauteed them I would cook the whole batch and keep it in the refrigerator to throw into whatever dishes I was making where it seemed like they would be a good match. But I was never all that thrilled with the flavor of the sauteed mushrooms and they would sometimes be rubbery. And then I stumbled across this new (to me) method of cooking mushrooms at The Spruce a few weeks ago. The first thing that interested me about the article was that they debunk the myth that mushrooms absorb a lot of water and should only be delicately brushed off and not washed. I was really happy to read that because I have always been a little skeeved out at the thought of how dirty the mushrooms must still be. 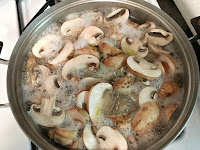 I cannot tell you what a relief it has been to me to thoroughly clean those mushrooms under running water! And then I tried this new method of cooking. 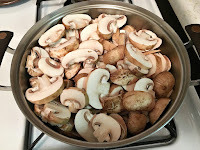 And had the best mushrooms I had ever produced in my kitchen. Ever. Who knew? 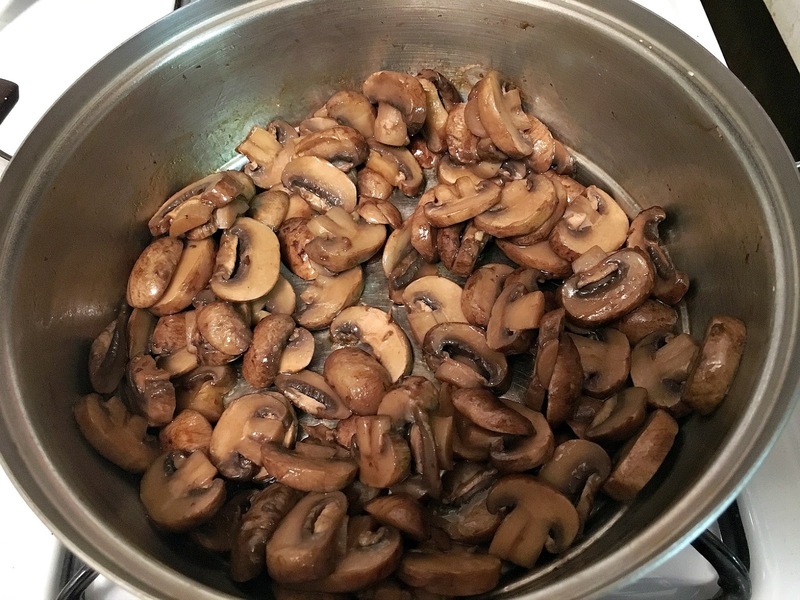 They are the essence of mushroom with a great texture. 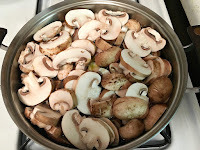 I make a big batch weekly and add them to whatever vegetable dish I am making, or salads, or weekend omelet or frittata. It is a delicious way to make sure I eat them regularly. The secret to the flavor is that you cook them in water with a little olive oil. A lot of water. And you cook them until the water is all gone and then season them and add any flavorings you want and let them sear in the oil once the water is gone. The end result is loaded with flavor. I was a little skeptical the first time I made them, so I thought I would provide a photo demonstration of the process. 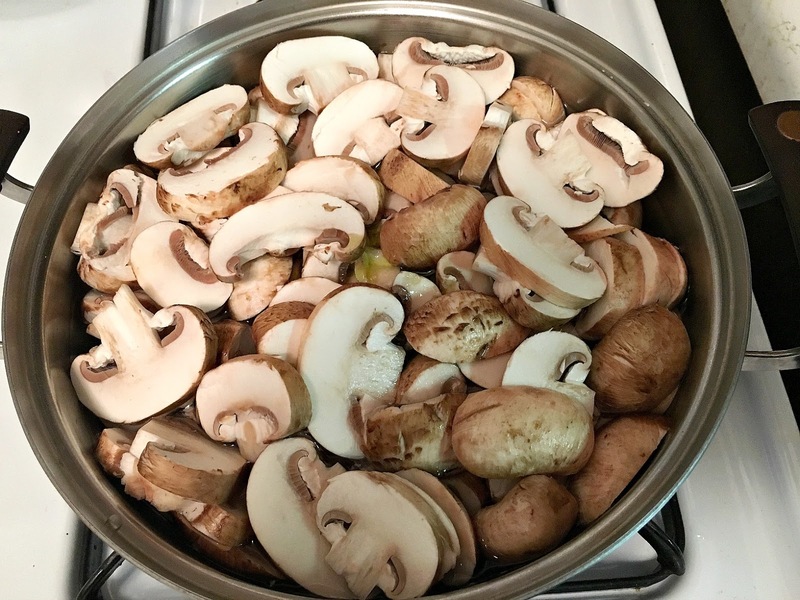 Cut the mushrooms about twice the size that you want them to be and place them in a pan that allows for them to stack up about three-high. You want the pan to be relatively full. These are crimini mushrooms, which are baby portobello mushrooms. They are also the same species as the white button mushrooms that are so common, but I like that little bit of color the brown ones have. But I use whichever kind looks the best when I am at the store buying them. 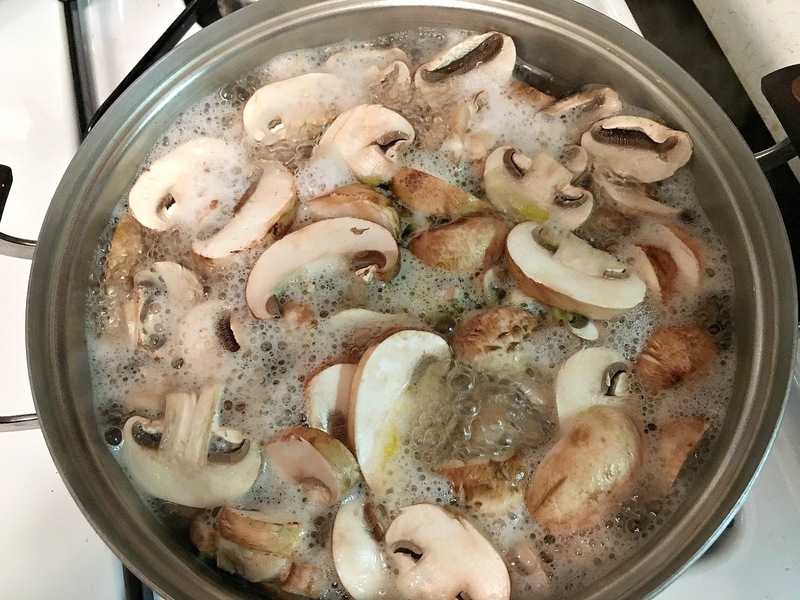 Fill the pan with water until the mushrooms are almost totally covered. This can be a little tricky because mushrooms float (more evidence that they do not absorb all that much water) so they don't really get submerged at all at first. What I do is I pour the water in and as soon as the mushrooms start to rise I will pour another inch or so and that usually does the trick. Add a generous tablespoon of olive oil. Turn the burner as high as it will go and bring to a boil. Once it is boiling, lower the heat just a little and let the water continue to boil until the water has boiled off. This will take about half an hour. You can leave it untended for the first twenty minutes or so, and then you should move close to the kitchen so that you are there when the water is gone. You will know when that has happened because you will hear the mushrooms sizzling. This is what they look like when the water has boiled off of them. You can see how much they have shrunk - they are about half the size as when I started. That is why you want to start with them about twice as big as you want the finished product. At this point I will add about 1/4 cup of sherry or white wine and a little salt, and then let the liquid cook off again. The end result is the photo at the top of the post. I added sherry and a touch of salt to those. They are packed with that lovely umami flavor that makes mushrooms so darned tasty. I make them once a week and keep them in the refrigerator so I always have them around when I need them. Although they do take some time there is minimal prep and very little maintenance. The next time you are at the grocery store pick up a package and give it a try. I am sure you will love them as much as I do.